What would you do if you won a Nobel Prize? Who would you thank? We’ve all wondered about it, perhaps not about the Nobel specifically, but about some potentially legacy-confirming prize or other — maybe an Oscar, maybe a MacArthur Fellowship. When Albert Camus, the short-lived French novelist-philosopher who wrote such enduring works as The Stranger and The Myth of Sisyphus, won the Nobel for Literature in 1957 “for his important literary production, which with clear-sighted earnestness illuminates the problems of the human conscience in our times,” he thanked an elementary-school teacher. 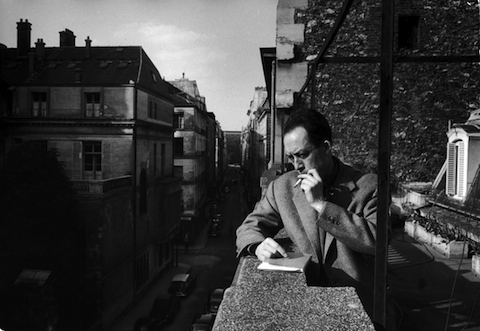 “One could argue that, in the history of the field, few teacher-pupil relationships have had more dramatic impact than that of Louis Germain on his young pupil Albert Camus,” says a Chicago Tribune article published during an upswing in American interest in Camus’ work. That happened soon after the publication of his unfinished autobiographical novel The First Man, a “classic story of a poor boy who made good” whose appendix includes the author’s real-life correspondence with his former teacher.